The BMC is the national representative body that champions the interests of climbers, hill walkers, mountaineers and ski mountaineers in England and Wales; we are also recognised by government as the national governing body for competition climbing. Read on to find out more about who we are, what we do, and how we are run. To be the organisation that every climber and hill walker wants to join. To be the natural champion and community hub for all those who climb hills, mountains, rocks, ice and indoor walls; to promote the interests and protect the freedoms of climbers, hill walkers, mountaineers and ski mountaineers. The BMC is a member organisation, and we currently have over 85,000 members, comprised of individual members as well as members of more than 250 BMC affiliated clubs. Organisations who wish to support the work of the BMC can join as associate members. In recognition of services to the BMC and the mountaineering community, the BMC awards honorary membership status. BMC Patrons are people who have provided exceptional support and assistance to the BMC. BMC ambassadors help the BMC raise its profile by acting as role models to inspire and engage young climbers, hill walkers and mountaineers, encouraging more young people to join and get involved with the BMC. The BMC was established in 1944 as the first umbrella organisation for British climbing clubs, to represent and speak on behalf of all climbers in Britain. The BMC’s strategic plan sets out the organisation’s key aims, and how we will achieve them. The BMC relies on a well-established structure of voluntary Specialist Committees, supported by staff, to develop and oversee much of the organisation’s technical work for members. The BMC is committed to equality and diversity in our work and will endeavour to remove any barriers, real or perceived, to lifelong participation amongst individuals, clubs, volunteers and mountaineering instructors. This commitment starts at the top and our Action Plan sets out a structure for achieving greater gender parity and diversity at Board level (the BMC Executive Committee) and on National Council. Achieve gender parity with a minimum of 30% of each gender on both the Executive Committee and National Council. Achieve greater diversity in general on the Executive Committee and National Council, including but not limited to black Asian, minority ethnic (BAME) groups and disabled people. 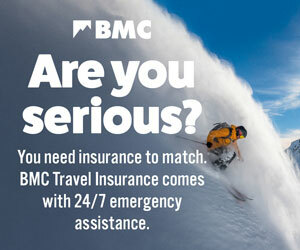 The BMC offers wide-ranging travel insurance cover for travellers, trekkers, hill walkers, climbers, mountaineers and skiers. All our policies are designed by active experts and tailored for our members. We also provide Combined Liability insurance (for club and individual members) and Personal Accident cover (for individual members). The BMC Online Shop stocks a massive range of publications to both inspire and educate. Our expanding range of clothing is also proving to be extremely popular with members. BMC membership is annual; you get 12 months’ membership from your date of application. Individual membership costs just £31.45 (£15.72 for the first year if you pay by direct debit); concessionary and family membership subscription rates are also available. The BMC Articles of Association set out the purpose of the BMC and how the organisation is run. The BMC is managed by a combination of the Board of Directors (previously called the Executive Committee), National Council, the Finance & Audit Committee and senior staff. The Board of Directors has overall responsibility for the strategic direction and operational management. National Council is made up of representatives from the BMC Areas, Specialist Committees and members of the Board of Directors, provides an intermediary forum between the Board and the members, and represents the interests of the members to the Board. The Finance & Audit Committee supports the CEO and Financial Controller and advises the Board on financial matters. The CEO is responsible for the day-to-day management of the BMC office. The Board of Directors is the ultimate decision-making body of the BMC, and is responsible for overall operation of the organisation, as well as setting and implementing organisational strategy in consultation with National Council. The Board meets four times a year. The Finance & Audit Committee monitors the BMC's financial performance, and advises on investments, accounting and budgeting, in order that the BMC can utilise its available financial resources to the best interests of its members and the organisation. The Finance & Audit Committee meets four times a year. The Nominations Committee is a sub-committee of the the Board of Directors, and has the responsibility for leading the process for Director appointments and making recommendations to the Board. The Nominations Committee meets as and when necessary to ensure effective succession planning for the organisation. National Council is comprised of representatives from the BMC Areas, BMC Specialist Committees, organisations which work closely with the BMC and members of the Board of Directors. It acts as a representative body of the members, consulting with and constructively challenging the Board of Directors, and holding the Board to account on behalf of the members. National Council meets at least three times a year. The BMC divides England and Wales into ten geographical areas: Cymru North Wales; Cymru South Wales; Lakes; London & SE; Midlands; North East; North West; Peak; South West; Yorkshire. BMC Areas provide a focus for local activities and are instrumental in driving national policy. Each BMC Area holds five meetings a year, and each precedes a meeting of National Council, to enable members to make their views known and be communicated to National Council. The BMC holds an AGM (usually in April), primarily for the purpose of presenting and adopting annual reports and accounts, appointing auditors and electing members of the Board of Directors. These procedures apply to all major ‘external’ complaints received by the BMC office from BMC members and third parties concerning the operation, management and policies of the organisation.